Oh, I would love My Little Girl by Tim McGraw. The Moon Shines Down looks great...thanks for the giveaway. I am subscribing to your feed via RSS. I will be blogging about your contest on my Wednesday Wanderings this week. I will post the link when I do. I'm with Shelburns- I think that My Little Girl by Tim McGraw sounds just wonderful. That's pretty exciting about The Moon Shines Down. We'd love to get our name in the hat. What an excellent giveaway...I would love the Sweet little princess book or My little girl the most! The Fourth King sounds like a book we would enjoy as well. by Tim McGraw and Tom Douglas. I would like the My Little Girl book. Thanks for the giveaway! I'd love to get the "Hermie and the High Seas" book...gotta love finding great books that teach kids about how important it is to follow Jesus!! My Little Girl sounds really adorable. Sweet Dreams Princess looks great! We love Hermie & Friends!! And we don't have Hermie & the High Seas, must add that to our collection LOL. Sweet Dreams Princess sounds great! I would love this book, I've read many of her stories as a child also. My Little Girl...I saw that book shortly after I found out I was pregnant again. I can't wait to get it for my husband if we end up having a girl this time!! I'd love Boomtown (and I'm sure my little boy would love it too). 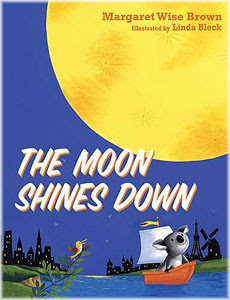 But I'm also intrigued by "The Moon Shines Down." "Good Night Moon" is a favorite in our house so I bet this one would be well-loved as well. I especially am a fan of the interactive features in both books - where you can find the mouse (and, in this case, the koala...) on every page. I also blogged about this giveaway as part of my Tuesday Tours column: http://metropolitanmama.net/2008/11/tuesday-tours-whats-happening-on-the-web-44/. I would love to win this for my daughter! Goodnight Moon (the original) is still her favorite. I also like the Sweet Dreams Princess -- my daughter would be smitten with it because it's princess themed, and I like that it's a child-sized devotional! What a great giveaway! My little guy would love Boomtown! I would like to get the Buginnings #4: Colors by Max Lucado. I had no idea he wrote children's books as well. God Bless Me!...my friend reads it to her daughter, and I'd love that book or another from that series for my son. He also adores Margaret Wise Brown stories! I'd love to read My Little Girl by Tim McGraw. Besides The Moon Shines Down, I am interested in Boomtown. Goodnight Warrior is a book I'm interested in! I would love to read My Little Girl! That's Tim McGraw? Like Mr Faith Hill? How cool is that! I have the original Gigi: God's Little Princess and my daughter loves the fun educational storyline along with the ever so pink illustrations. So, I would opt for Gigi, God's Little Princess: Gigi's First Day of School. Nice giveaway. The Moon Shines Down sounds wonderful. I checked out the Nelson website and was intrigued that they had a Spanish section. I was hoping it was for children but it was for adults. We speak Spanish at home and I am always tickled to pick up a familiar book in Spanish to read to the little ones. Hoping I win one of your three copies of the Moon Shines Down, maybe it will be translated one day! I like All Things Bright and Beautiful. Thanks for the contest! All Things Bright and Beautiful sounds wonderful. I would love My Little girl by Tim McGraw. Thanks for having such a great giveaway. I have to say I want to read My Little Girl. I love Tim and Faith and I really love that he wrote this book. Sweet dreams princess. I would love to have a copy. I am also going to subscribe to your site. I hope you drop by mine too. My Little Girl would be awesome, just b/c I grew up on country and Tim McGraw is just one of the big names of that genre.